SYL JOHNSON-DIAMOND IN THE ROUGH. In previous articles I’ve written about Southern Soul, I’ve focused on one particular label, Hi Records. Previously, I’ve written about three of their most famous artists, the legendary Al Green, O.V. Wright and Otis Clay. These three artists produced some of the most successful and critically acclaimed albums on the label. However, these three artists weren’t the only artists to record for Hi Records, Ann Peebles, Don Bryant and the artist this article is about Syl Johnson, all recorded successful albums for the label. Like the other artists I’ve previously written about, they were guided by Willie Mitchell, who produced all the albums on Hi Records during its most successful period during the seventies. To create the sound he wanted, he used Hi Records house band, the Memphis Horns, The Memphis Strings and backing vocalists Rhodes, Chalmers and Rhodes. By adding all these ingredients to the albums he produced on Hi Records, Willie Mitchell produced one great album, after another. This included the four albums Syl Johnson recorded for Hi between 1973 and 1978. In this article, I’ll write about the second album he recorded for Hi, Diamond In the Rough. His first album on Hi was Back For A Taste of Your Love released in 1973. After that, he released Diamond In the Rough in 1974, Total Explosion in 1975 and Uptown Shakedown in 1978. Before I review Diamond In the Rough, I’ll tell you about Syl Johnson’s career. Syl Johnson was born Sylvester Thompson in July 1936, in Holy Springs, Mississippi, the youngest of seven children. Two of his brothers like Syl, would go on to have careers as musicians. Mac Thompson and Jimmy Johnson would go on to have successful careers, with Jimmy becoming a famous blues guitarist. Later in life, Syl and Jimmy would record an album together, entitled Two Johnsons Are Better Than One, which was released in 2002. His first solo record contract was with King Records, and he recorded six singles on their Federal label between 1959 and 1962. These singles were a mixture of blues, soul and much more pop oriented material. However, none of the singles sol particularly well, despite being well promoted by his label. It was after recording with one of the best known producers of the day Sonny Thompson, that Syl decided to produce his own material. This he did for the two singles he recorded for the Zachron label. Like his singles on Federal, but apart from selling well locally, they too, failed commercially. After that, he recorded for TMP-Ting and Tag Ltd, and still he couldn’t make a commercial breakthrough. It would be 1967 before Syl issued a successful single, entitled Come On Sock It To Me, on the new Twilight label based in Chicago. He followed this up with Different Strokes and I’ll Take These Skinny Legs. In 1969 Syl’s released his most successful single and album both entitled Is It Because I’m Black? This was a a single and album that was socially aware and tapped into the social problems of the era. Suddenly, after years of trying, Syl had a first a hit single, and then a hit album. By now Syl was a star, and was also head of A&R at Twilight, which had now been named Twinight. As if this wasn’t enough, he started setting up Shama, his own label in 1968. Shama signed acts that Twinight decided not to sign, and to record sessions for his new label, Syl enlisted the musicians that played on all the Twinight recordings. In 1969 Syl decided to head south to Memphis to record sessions for his Shana label. The reason for the trips to Memphis was Syl wanted to change the label’s musical style, and admired the sound coming out of Memphis. Some of the sessions took place in the Hi Records studios. Once there, he realized that Willie Mitchell had put in place one of the best studio bands in music. When Shama and Twinight experienced financial problems, Syl decided it was now time to sign to Hi Records. This was the summer of 1971, and in the next seven years he’d release four albums for his new label. The first album Syl released for Hi Records was Back For A Taste of Your Love released in 1973 reached number nineteen in the R&B charts. After that, he released Diamond In the Rough in 1974 which failed to chart, Total Explosion in 1975 reached number fifty-six in the R&B charts and Uptown Shakedown in 1978 failed to chart. However, by 1977 when Syl was recording his final album, Uptown Shakedown, disco was by now, hugely popular, and Memphis soul records like the ones Syl was recording weren’t selling well. By then, Hi Records had been taken over by Cream and they decided that the album should be recorded on the West Coast, instead of in the Hi Studios. Uptown Shakedown was recorded with some of the West Coast’s best session players. Sadly, the album was the weakest Syl recorded for Hi and as a result, failed to trouble the charts. By then, Syl had set up his Shama label and released a number of singles and the album Ms. Fine Brown fame in 1982. His next album was 1984’s Back In the Game. It was at this time that Syl started a fast-food fish restaurant and was now semi-retired, only making occasional appearances at local blues clubs. In 1992 Syl discovered that his music was being sampled by a number of hip-hop and rap artists, including the Wu-Tang Clan and Public Enemy. This spurred Syl to make a comeback. His comeback album was Back In the Game which featured the Hi rhythm section and his daughter Syleena. The following year 1995, he recorded an album with his daughter Syleena entitled This Time Together By Father and Daughter. Further albums would follow including Bridge To A Legacy in 1995, Talkin’ About Chicago in 1999 and Hands of Time in 2000. In 2002 Syl released an album with his brother Jimmy Johnson entitled Two Johnsons Are Better Than One. Last year, 2010, a box set retrospective of his early work was released entitled Syl Johnson: Complete Mythology. It’s nearly fifty years since Syl signed his first recording contract. He has been a musician and singer since the 1950’ and has recorded for a number of labels over these five decades. However, it’s one of the albums he recorded for Hi Records, Diamond In the Rough, that I’ll now review. This was an album that failed to chart, so what I’ll now tell you, is whether this is a good album or not. Diamond In the Rough begins with Let Yourself Go which begins with a piano playing slowly and spaciously, before the rhythm section and organ enter, transforming the track into a brighter, more melodic one. After that, Syl’s charismatic tenor voice makes an appearance. He’s accompanied by Rhodes, Chalmers and Rhodes on backing vocals and The Memphis Horns who both occasionally punctuate the track in short, sharp bursts. Syl meanwhile, is giving a powerful and passionate rendition of what’s one of the slower songs on the album. Occasionally, he kicks loose, his voice strengthening, getting louder and even more passionate. As ever, Willie Mitchell’s arrangement is perfect for the track. The rhythm section and Memphis Horns driving the song along, never once overpowering Syl’s charismatic vocal. Guitars play at the start of Don’t Do It, before The Memphis Horns interject, announcing Syl’s introduction. When Syl sings, he’s got some explaining to do in the song, he’s having to talk his girlfriend out of leaving him. It’s a song about love and relationships which Syl sings brilliantly, bringing the lyrics to life. He sings the song with passion, almost pleading, while the backing vocalists, The Memphis Strings and The Memphis Horns accompany him. As usual, the rhythm section play brilliantly, providing the perfect backdrop for Syl’s tale of woe. It’s the horns especially, that add to the songs drama. However, the star of the track is Sly, and his pleading, passionate delivery of the song. I Don’t Want To Take You Home (To See Mama) has a very different sound to the two preceding tracks. It bursts into life with The Memphis Horns playing brightly, before Syl sings. When he does, his voice sounds nearly joyous. Throughout the track he’s accompanied by the backing vocalists whose contributions really lift this song. Their voices rejoice sweetly and joyously, the perfect accompaniment to Syl’s vocal. Like the backing vocalists, The Memphis Horns contribution is huge, with them accompanying Sly throughout the track, drenching his voice with their beauty. Here, Syl gives one of his best performances on the album, and together with the backing vocalists and horn section’s contribution, Willie Mitchell has produced one of the album’s best tracks. An organ plays, giving the song a really sad, melancholy sound and is accompanied by drums, guitar and keyboards as Could Be Falling In Love With You begins. As Sly sings, it’s apparent straight away, that this is another fantastic song that’s unfolding. Syl gives the most heart achingly beautiful rendition of the slowest song on the album. It’s made all the better with the subtle use of the backing vocalists and the band playing really slowly behind him. They allow Sly to take centre-stage, and do what he does best, deliver songs with emotion and passion. What makes the track just so good, is Syl’s vocal and the arrangement which, for the most part meanders along beautifully. The only time the horns play, is towards the end, where they make their presence felt and add to an already sad, emotive arrangement. Like the previous track, this is one of the album’s highlights. The tempo increases with Stuck In Chicago, a track that begins with guitar and The Memphis Horns playing, before the rhythm section enter. When Syl sings, his voice is much stronger, and is accompanied by strings playing in the background and the horns interjecting adding to what is a much fuller arrangement, laden with sadness, drama and atmosphere. An organ adds to the already sad and dramatic arrangement. In the song, Syl is down out of money and out of luck, having been stood up by his girlfriend. Like on other tracks, Syl brings the lyrics to life, and you end up feeling sorry for him. His delivery is emotional and dramatic, and the arrangement adds to the sense of drama, especially through the use of the horn section on the track. Overall, it’s a great track thanks to Syl’s vocal, The Memphis Horns and producer Willie Mitchell. The title track Diamond In the Rough is another dramatic sounding track, that begins with drums crashing, keyboards and the horn section combining before Syl sings. When he sings, his tenor voice is strong and loud, while behind him, the rhythm section and The Memphis Horns especially, concentrate on producing a dramatic sounding arrangement. Later, strings sweep in, their sound lush, in contrast to the brash sounding horns. Together, the rhythm section, horns and strings succeed in producing one of the best, most dramatic sounding arrangements on the album. Syl meanwhile, matches their efforts, producing a vocal that’s emotional and drenched in drama. Keepin’ Down Confusion has a lovely introduction, with drums and organ playing, with the backing vocalists singing sweetly. After that, Syl sings, his voice strong, clear and loud. Like before, his vocal is charismatic, bringing meaning to the song, through emotion and passion. While he sings, an organ and The Memphis Horns inject further emotion and drama, with the help of Rhodes, Chalmers and Rhodes, Hi’s legendary backing singers. The arrangement is slower than on the previous two tracks, and this seems to add to the dramatic sound and feel of the track. Here, the success of the track is down to the tempo and arrangement, and of course, a vocal laden in charisma and feeling, courtesy of Syl Johnson. It’s an organ and The Memphis Horns that dramatically, accompany an almost pleading, Syl at the start of Please Don’t Give Up On Me. Backing singers add to the drama when they accompany Syl. Between the interjection of the horn section and the contribution of the backing singers, it’s an already dramatic arrangement that’s unfolding. The rhythm section’s contribution heightens this sense of drama, as does Syl’s vocal. Here, he really lets loose his emotions, as he pleads and begs for his girlfriend not to give up on him. This is an outstanding vocal from him, made all the better by Rhodes, Chalmers and Rhodes backing vocals. What shouldn’t be underestimated is the contribution of all the musicians that play on the track. Without their contribution, the track wouldn’t be half as good. Their playing combined with Syl’s desperate vocal make this a great track, one that’ll pull on you heartstrings. A piano plays at the start of Music To My Ears, but doesn’t give you any indication of what’s to come. What follows is the rhythm section and The Memphis Horns combining before Syl sings joyously. Behind him lush sounding strings sweep in, horns punctuate the track and the backing vocalists compliment Syl’s voice perfectly. It’s a track with a quicker tempo, one that sweeps along, and in the process, sweeps you along in its wake. Quickly, you’re caught up in Syl’s joyful, sounding vocal, complete with a catchy, melodic, arrangement where hooks are plentiful. This track demonstrates the versatility of Syl’s voice. He’s equally at home singing uptempo, joyous songs like this, as he is singing the sad songs, drenched in emotion and drama. After the sadness of the previous song, this is the perfect contrast. Diamond In the Rough closes with I Hear the Love Chimes which has a subtle introduction with keyboards, drums and guitar playing, before a short burst of the horn section announces Syl’s entrance. Here, his vocal is much more restrained, quieter, relying less on power during this track. Behind him, the rhythm section and Memphis Horns combine to produce a lovely, dramatic, slice of Southern Soul. It’s punctuated by horns, with an organ, atmospherically playing, adding to what’s already a lovely slow arrangement. Backing singers occasionally interject, singing sweetly in unison. This is a lovely, melodic, track to end the album, Syl’s vocal is much more subtle, while the arrangement is slow and dramatic, thanks to The Memphis Horns and the rhythm section. 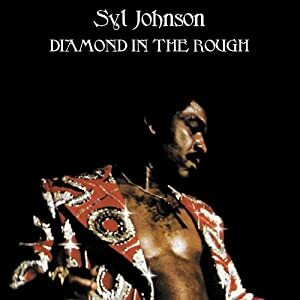 I’ve always wondered why Diamond In the Rough didn’t build on Syl Johnson’s debut album Back For A Taste of Your Love which reached number nineteen in 1973. Diamond In the Rough has ten great songs on the album, all sung brilliantly by Syl. On the album, Syl demonstrates his versatility as a vocalist. He’s equally comfortable singing slow and fast songs alike, and delivering dramatic and sad songs just as comfortably as he does the faster tracks. Throughout the album, he adjusts his voice to suit each song, delivering them beautifully. Like his first album for Hi, Willie Mitchell produced it, and it featured The Memphis Horns, The Memphis Strings, the famous Hi rhythm section and Rhodes, Chalmers and Rhodes. It had everything going for it, but for some reason, the record buying public overlooked this excellent album. However, since its release, many soul fans have discovered this album, albeit belatedly, and they like me, love the music on it. Thankfully, it was released on CD in 2000 by the Demon Music Group as part of The Complete Syl Johnson On Hi Records which features the four albums Syl recorded for Hi. On that two-disc set you can hear everything that Syl ever recorded for Hi, complete with bonus tracks. For me, it’s the perfect introduction to the marvelous music of Syl Johnson. So if you’ve never heard his music, why not treat yourself, you won’t regret it. Standout Tracks: I Don’t Want To Take You Home (To See Mama), Could Be Falling In Love With You, Please Don’t Give Up On Me and I Hear the Love Chimes. ← THE HACIENDA AND ITS MUSIC-THE HACIENDA COMPILATIONS.